Removes snails if unwanted, including Pond Snails, Bladder Snails, Ramshorn Snails, Malaysian Trumpet Snails (MTS), and more. Beautiful black and yellow coloration. Will not attack anything but snails – safe with shrimp, fish, live plants, etc. 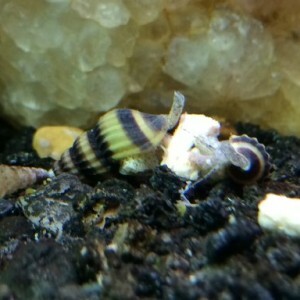 Assassin snails are one of the most useful animals in the aquarium hobby. I came across them when I had snail infested tanks, but did not want to use harsh chemicals to kill the snails. 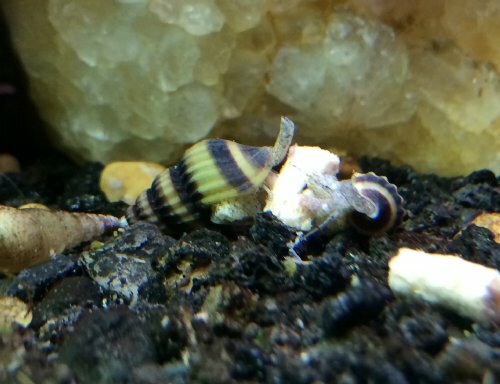 I have had 30 gallon tanks that were totally overrun with unwanted MTS Snails, and my 5 “Assassins” dealt with over 100 of them within a couple weeks using no chemicals. They are a very attractive color as well. 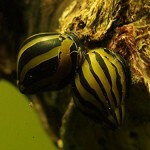 Because of the black and yellow striping, they look fantastic on both light and dark colored substrates. 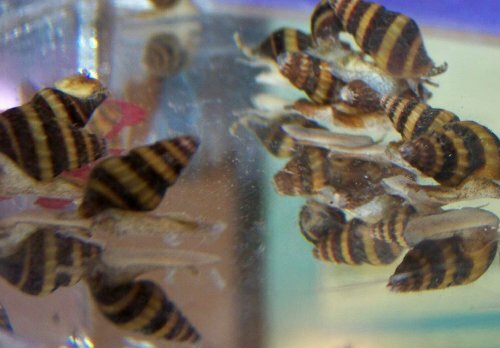 Assassin snails grow to about 2″ long. – Recommended Aquatic Arts tank mates: Dwarf shrimp (such as Blue Velvet shrimp, Sakura Fire Red Cherry Shrimp, Neon Yellow Shrimp, etc. ), and small to medium-sized, non-aggressive fish (such as danios and guppies). They eat all other types of snails that are their size or smaller, but they will not harm snails that are larger (such as Mystery snails, Giant Sulawesi snails, larger Nerite snails). 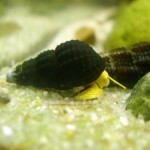 However, a group of assassin snails has been known to gang up on a larger snail and cause it harm. – Additional notes: Having good substrate is important with Assassin Snails, as they love to burrow in it. Other than snails, they eat leftover fish flakes or invertebrate pellets. 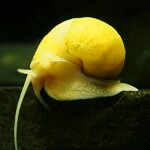 Snails are very sensitive to copper, so watch out for copper if you use tap water in your tank. Useful in shrimp tanks/etc where snail-killing chemicals cannot be used, or if you don’t like using harsh chemicals in your aquarium. © 2019 Fish Tank Equipment. All Rights Reserved.